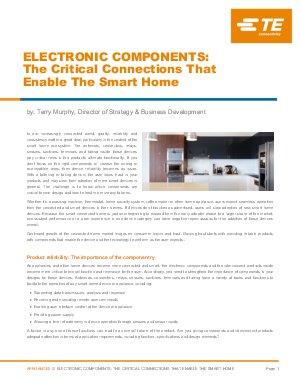 In our increasingly connected world, quality, reliability and consistency matter a great deal, particularly in the context of the smart home ecosystem. The antennas, connectors, relays, sensors, switches, terminals and tubing inside these devices play critical roles in the product’s ultimate functionality. If you don’t focus on the right components or choose the wrong or incompatible ones, then device reliability becomes an issue. With a faltering or failing device, the user loses trust in your products and may slow their adoption of more smart devices in general. The challenge is to know which components are crucial to your design and how to best minimize any failures. Continued growth of the connected home market hinges on consumer buy-in and trust. Gaining trust starts with providing reliable products with components that enable the device and the technology to perform as the user expects.